Garage door not opening or closing? Here are the most common reasons a garage door has stopped or won’t open. You can fix your garage door with these easy troubleshooting tips. The garage door repair methods we have listed below are the most common reasons why your door has malfunctioned. 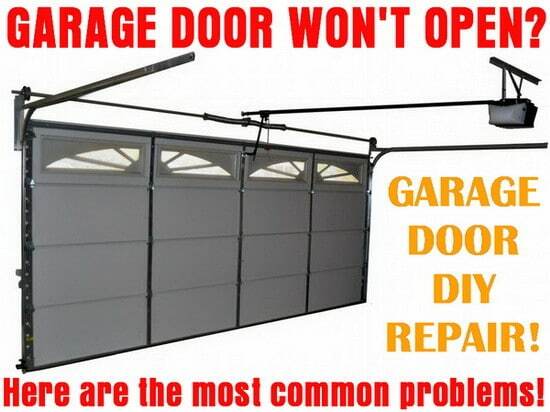 Garage doors vary and not all will be easily fixed yourself. Some things that go wrong with your garage door will need to be repaired by a professional garage door repair company. 1 – Your garage door remote does not work. First make sure it is not the battery in your remote. To find this out, simply use the button on the wall to see if the garage door opens. If the button on the wall opens the garage door, install a new battery in your remote. 2 – Your garage door motor is not plugged in or not getting power. It may be plugged in but electricity is not being supplied to the outlet. Make sure your garage door motor is plugged into a powered outlet. Your garage door outlet may have a GFI safety reset on it. It may need to be reset if it has tripped. Press the small red button on the outlet and if you here a click you most likely just fixed the problem. If you are not sure if the opener is getting power, plug the garage door opener into an extension cord and plug the extension cord into an outlet that you know is working. 3 – The photo beam eye (sensor) connection is being disrupted. Just about all garage door openers have a photo eye (safety beam). This eye is a safety feature that will stop the door from closing if it detects a person or anything that is in the way of the door. Make sure there is nothing in the way of the eye beam. Sometimes the photo eyes can accumulate dirt and dust. If they are dirty they may think the connection is broken leading to the door not closing properly. To fix this issue you can wipe the photo eyes with a rag or similar. Do not get the eyes wet as they may stop working. Another issue could be that the photo eyes are not properly aligned. To fix this issue you can try to align the eyes so the beam points into each eye. 4 – The cables may have snapped. When a garage door spring snaps the cable usually breaks also. The outcome from a broken cable will usually result in the door not opening even when tried manually. The door will feel very heavy and won’t stay in place. Check the garage door to find out if this is the case. If so it is recommended to have a professional install new cables. 5 – The spring may be broke. The spring or springs that assist to lift the garage door can break or snap. This results in the door not opening or closing. The outcome from a broken spring will usually result in the door not opening even when tried manually. The door will feel very heavy and won’t stay in place. If you have a garage door with a broken spring, it is best repaired by calling a professional as installing these high tension springs can be dangerous. 6 – Gears may be stripped or bad control board. The garage door may or may not open and issues can be intermittent. The garage door motor/operator may have a bad control board or the gears in the opener can be worn or stripped and cause your garage door to have intermittent issues. If all obvious things can be ruled out, the garage door motor/operator may need replaced. 7 – Burning smell from garage door motor. Most likely a spring or cable has snapped. The motor is trying to open the door but does not have the assistance of the spring or cable. Do not continue to try and open the door with the motor or it may burn out. The solution for this is to check and replace the broken spring or cable. 8 – Door opens and closes but is noisy and squeaks. When your garage door is making loud scraping and squeaking noises, it usually just means that certain parts of your door need to be lubricated. To stop the garage door from squeaking, use a garage door spray lubricant and spray the hinges, rollers, tracks, and springs. (See the chart below to know where to lubricate your garage door) These are basically all the parts of your door that move and lubricating them will stop the squeaks. Lubricating these parts on your garage door is also part of preventive maintenance so doing so will prolong the life of your garage door. 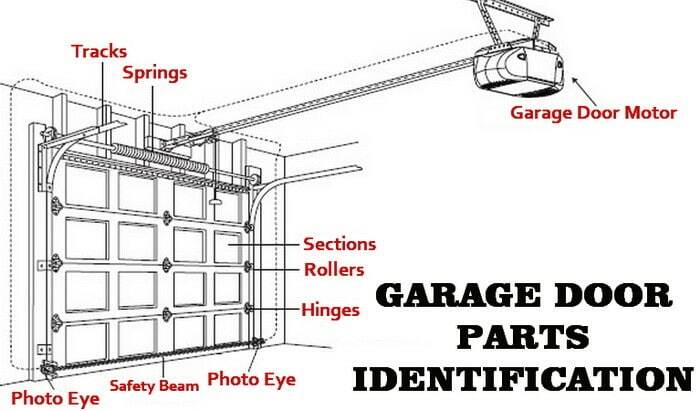 Here is a parts diagram to help you determine what is faulty on your garage door. BROKEN SPRING, ROLLER OFF CENTER, OPENER IS FAULTY, GARAGE DOOR FELL OFF TRACK, BROKEN REMOTE CONTROL, CRASHED CAR INTO GARAGE DOOR, DOOR IS BENT, DOOR IS SAGGING, NOISY GARAGE DOOR, and BROKEN CABLE. All of these issues are possible causes of why your garage door has stopped working. Going through the checklist at the top of this page will help you to rule out the most common faults. Checking power, changing batteries, and cleaning and aligning the photo eyes can all be done quite easily yourself. When your garage door has broken springs or snapped cables, we recommend hiring a professional to safely fix your door. How to keep your garage door opening and closing. You can also read this garage door safety checklist to perform routine maintenance to keep your door working properly. It is a good idea to routinely check certain parts on your garage door to catch a problem before it results in a door that will not open. Preventive maintenance is always the best method for keeping your garage door safe and in working order. Do you know of other reasons a garage door will not open? Please assist the readers of this page and leave a helpful comment below. NEED HELP? If your garage door is broken and you need free advice, leave us a comment below explaining your problem and a professional will get back to you with the steps to take to fix it yourself! Wall mounted myliftmaster not working. When I try using the learn button and reprogramming wall remote outside the garage I do not get a confirming acknowledgement from the inside overhead unit. I am able to have the garage door descend but am unable to have it raise up again. My garage door will not open in manual position. It gets caught on the release rail if you pull it over the door it gets torn at top. My Garage Door is Closed. I put new batteries in the remote last night. I can’t get inside Garage at all. 2c Model Number, Serial number etc. The Remote is from Sears Roebuck and this Remote has a Circut Board Inside. The batteries for Garage remote are (2) DL2016. Our garage door has stopped opening and from what I have read from your article, I am thinking that the spring might be broken. We have two cars in the garage and we haven’t been able to go anywhere for the past few days. Thanks for the great information, I’ll have to show it to my husband! Door opens all the time. Closing it starts to but will go back up 50% Of the time. If you manually assist it with the motor going it will close. The motor sounds like it is working hard. I have it adjusted to full power. When I open it close it without the motor it seems to glide fairly easily. Motor is 12 years old. Springs need loosened? New motor? My garage door doesn’t close all the way. It opens all the way but it seems like when it closes it opens right back up. My garage is separate from my condo and the garage door is the only way in. The garage won’t open all of a sudden with the opener. I did change the batteries in both remotes. I also roughed up the contact where the battery makes contact on the circuit board to improve the power to the infrared signal. Neither still do not work. #1 How do I open the door when we have removed the release cord due to a previous break in. #2 What else can I do? I need to open the garage door and there is definitely tension when I try to put my fingers under the door and lift slightly. On most garage doors that are in a condo complex there is a key slot on the front of the door to open it if you lose your remote. You should have been given keys by the condo association when you moved in. Is there a key slot? If not can you ask the condo HOA for a new remote to open your garage door? My garage door hasn’t been opening for such a long time now, and I have no idea what is going on with it. So I really appreciate you talking about this, and giving me some great insight on what could be my problem, and how I can fix it. I’ll definitely try these out, and see if I can finally get it working again. A lot of people call a tech and think their garage door opener is broken and then it turns out they just needed to replace or charge the battery. My garage door is giving me trouble. Whenever I close the garage door, the second it reaches the floor it goes back up again. The checklist that you provided was very helpful. I’ll be sure to try all of the things that you listed. We had to recently replace the cables in our garage. They weren’t working properly. I had no idea how to DIY this replacement, so I called professionals. They were able to identify and solve the problem quickly. They had tools, equipment, and experience that I didn’t. They were quick and did a good quality job. Thanks for the troubleshooting advice on garage door repair. I think the spring is broken on mine. That is something I should probably leave to the professionals for fixing. I am wondering if my garage door’s gears may be stripped, or it might have a bad control board. My garage door opener does not work very well. I often have to press the button three or four times before the garage door will open. Sometimes it doesn’t open at all. As the issues are intermittent, it sounds like stripped gears or faulty control board might be the culprit. Take it apart and inspect the gears inside. I think it’s funny that sometimes I don’t even check to see if my remote isn’t working. I have spent some frustrated time looking for a problem that would be fixed if I just had thought of that. Thanks for all the information that you shared here. My garage door hasn’t been opening at all today, and I haven’t figured out why that is yet. I haven’t actually checked the spring, so that very well could be the issue. If it turns out that my spring broke, will it be costly or time-consuming to replace? If spring is broken, hire a pro. A broken garage spring can cause injury. I’m sure grateful that I stumbled upon your article! I’ve been trying to figure out why my garage door isn’t opening, and it’s been very frustrating! I think the most likely explanation is that my spring is broke. So, with that in mind, I’ve decided to have a garage door repairman come out to my house later this week. I’m hoping that I’ll have everything fixed and running soon! You mentioned in your article how cables and springs are sometimes responsible for a faulty garage door; are they related in any way? It is really interesting to hear about how common these garage door problems really are. It is also really interesting to hear about all of the different things that could be wrong with your garage. When it comes to having a garage door opener that doesn’t work, I definitely agree that you should check the batteries first. Some problems like this may be a really quick fix, however, most problems are a lot more serious. Recently I have been noticing that my garage door isn’t working very well. I think that it would be really great if I could get it repaired, since it seems like the springs in my door have broken. Right now it isn’t opening at all, even when we try to do this manually. I will definitely call a professional to help me, especially since dealing with these springs can be dangerous. Thanks for sharing this great information! I’ve been looking forward to getting my new garage door put in, but I can’t get the remote to work. Is there something that I need to do to connect it? I thought that I set it all up, but I might need to call someone down. We’re just using our old opener, so maybe we just need a new one. Thank you for these common problems and fixes. I know how to replace various mechanical parts, but the electrical side of garage door maintenance is not my strong suit. I don’t think I have any issues with springs, but I will have to check the sensor, the motor, and the photo beam to make sure they are all in working order. This is really helpful. We have been having trouble with our remote lately. I think it may be the battery, like you said. However, It is good to know what I should look into if it is not the battery. My son was leaving the house the other day to go to school and when he tired to open the garage door, the cable broke and it wouldn’t open. He called me and I came home and looked at it briefly, but I wasn’t able to fix it. I then took him to school in my car and I made a few calls. I will have a repairman come to the house after I get of work and hopefully we will be able to get this fixed. It was a loose and misaligned pulley!! By gosh I think I can fix anything but a broken heart!! I have an older garage door opener model R 80z serial 22768 by overhead door company. After the door is up or down, the motor keeps running. Now it is down and the motor just runs with out moving the chain.